The SS-100L Super Spreader™ Cast Net has a true pound of REAL LEAD WEIGHT per radius foot and a bullseye net design that propels the cast net to sink at a fast rate. Cast nets in the SS Series are one of the most popular cast nets sold in America, and the SS-100L covers all of your casting needs! 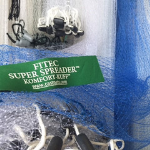 10277 - SS 100L 7' x 3/8" Mesh, Blue Mono - $88.95 The SS-100L Super Spreader™ Lead Series Cast Net is one of the newest and fastest growing cast nets sold in America! A “true” POUND of REAL LEAD WEIGHT per radius foot and Bulls Eye Design propels the Cast Net to sink at a SUPER Rate.